In the darkest night, a handful of supernatural survivors of the ancient races met on the field of battle to pit their preternatural powers against each other in their ongoing struggle. 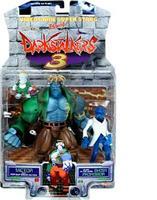 These wonderous warriors known as Darkstalkers wage a never-ending battle, feuled by dark forces, magical spells, enchanted weapons and bizarre transformations. Their rivalries span the centuries as these noctunal hunters attempt to defeat each other and become the lone Darkstalker able to harness the Dark Force. As the immortal combat rages on, alliances are forced and broken as the thunder of fists and lightning of kicks fills the misnight sky; signals of the ongoing struggle of the Darkstalkers. Don't fear the dark... fear the Darkstalkers!